looking very teal here. but i'm pretty sure these two colours go well together (right?). but i really don't need any excuse to wear these trousers, they're my all-time favourites, i really can't get over them. and as for this blouse, it's so bloody nice. what a colour. when i saw it on the f21 i was all ready to snaffle it up, but they only had it in a size L, but i loved it so much i bought it anyway, and i'm glad i did because it's not that big, and i like stuff oversized anyway. Loving the little glimmer of what looks like a moustache necklace! Great outfit and the two colours are perfect together! You're just so cute! I love all your outfits. This is a really pretty outfit! I recently started my own blog and i'm having trouble changing the size of the pictures... can you help me? Cute mixing of the different shades of teal. Love the simplicity of your look. Those polkadot trousers are incredible! I love them! Ahh <3 those trousers and I love the two greens together! this blouse is perfect *,* i love teal! 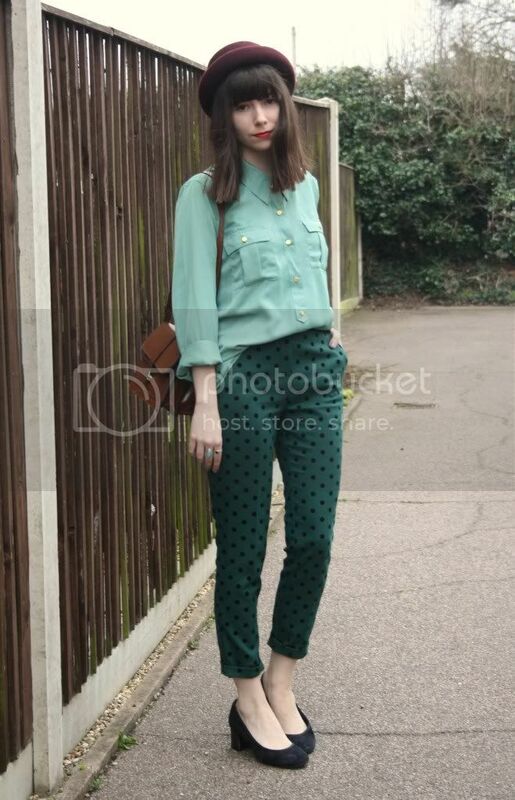 Love that blouse, I'm obsessed with mint hues at the moment, and it looks perfect with the teal trousers. Love the pants and also the blouse .... cute!!! You look all kinds of adorable! Damn, I wish I could wear hats like you do! lovely outfit! Your blouse is so pretty! I have these trousers in blue :) love the green ones aswell! You did well in getting the blouse even if it's bigger, I love them oversize too. The trousers are great, you made me want to look some pretty things in top shop:p love the colors of both especially! incredible shirt, and love the moustache necklace! 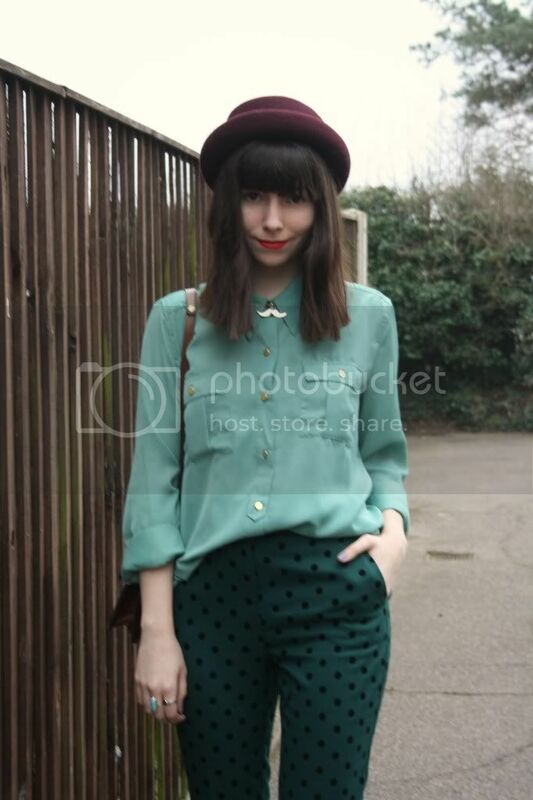 not only do I adore teal, but those trousers are delightful, especially with the bowler hat. Those pants are incredible!! Love the combination of the different shades of green! I love your blog so much. You always look amazing. You pull off those pants so well too! These colors look so awesome together! I love those dotted trousers so much. I´ve just discovered your blog! You´ve got really great and personal style! Love both trousers and shirt! xoxo & nice to meet you! I love the little mustache necklace! It looks so cute peeking out of the collar of your shirt. Love the polka dot trousers. I have the same ones :-) I have worn them to death.